I really think this video is amazing. I’ve seen a lot of festival compilation videos before, but I’ve never seen one put together this well. The festival commissioned these filmmakers known as Already Alive to make a video that shows the festival in a way that words fail to capture. Instead of it being a montage of the performers mixed in with some freaky shots, the bulk of the frames are focused on the ecstasy of the moment. And despite these guys presumably filming for four days straight, they’re able to make an all-encompassing piece that is under four minutes long. What really grabs me is the pacing here. The video starts out with a rapid fire of quick shots, and also uses a nice touch of black space between them. It’s almost like someone opening and closing their eyes. Then it pauses and switches to these great slow-mo cuts with extended interviews over the top – really giving it room to breathe. And then the music starts to slowly build again and the images start to come quicker, and by the time we reach the end we’re back at that same rapid fire progression that started the whole thing off. Excite > breathe > re-excite. It’s like they get your heart-pumping but then pull back so you don’t’ get too overloaded, and then they come in for the kill at the end. Killer sequence editing. I’m not sure how many of you guys may have seen this already, but this video has been in constant rotation on my Facebook feed for the past month. 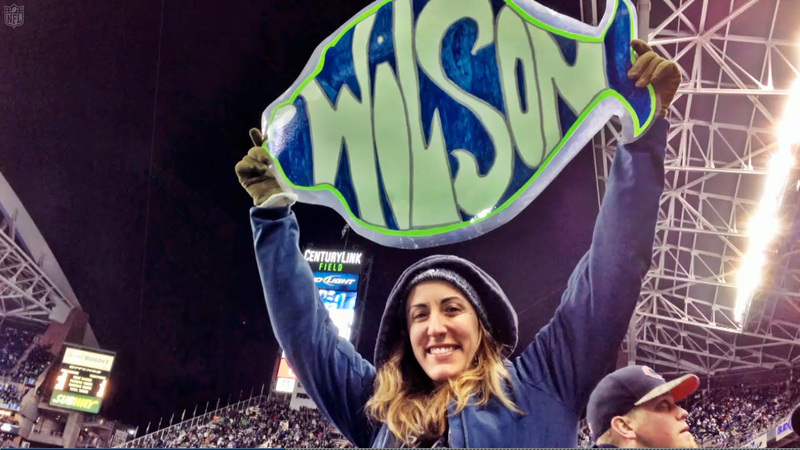 The reason for that being that I’m friends with a ton of Phish fans, and also a solid amount of Seattle Seahawks fans – this video shows where their two paths cross. So there’s a few things I’ve taken from this video – one is how different 8 minutes is compared to 5 minutes. Those quick blurby moments can be extended to full scenes, and the ability to give a piece room to breathe is quite clear. This is something to think about as we prepare for next semster’s Producing Story class. I also think this piece does a great job of flowing background sound and music from one section to the next. That use of flowing audio is essential for connecting clips that could feel potentially non-sequitor otherwise. The biggest thing I’ve taken from this video however is the idea of having a subject being relevant to two seemingly unrelated audiences. It seems like a huge thing to think about when you’re trying to connect to as large of an audience as possible. There’s plenty of Seahawks fans that don’t watch every video about their team. But when they have friends that are into Phish turn them onto the video, it creates this additional connection to the piece that makes them want to pay attention. The same situation occurs vice versa – not every Phish fan watches every video about their favorite band, but when their Dad tells them he saw a piece on ESPN about them, then again a different path of connection is created. It’s almost like luring in your audience. And again, this piece is a solid inspriation for what I’m trying to do with my Grateful Dead bowling piece – rope in bowlers to watch Deadheads, and rope in Deadheads to watch bowling. What’s really interesting in this piece is that it seems there were two edits done – one is more heavy on the Seahawks footage and one is heavier on the Phish footage.